The two main methods for determining the average daily near-surface air temperature, twice-daily averaging (i.e., [Tmax+Tmin]/2) and hourly averaging (i.e., the average of 24 hourly temperature measurements), typically show differences associated with the asymmetry of the daily temperature curve. To quantify the relative influence of several land surface and atmosphere variables on the two temperature averaging methods, we correlate data for 215 weather stations across the Contiguous United States (CONUS) for the period 1981–2010 with the differences between the two temperature-averaging methods. The variables are land use-land cover (LULC) type, soil moisture, snow cover, cloud cover, atmospheric moisture (i.e., specific humidity, dew point temperature), and precipitation. Multiple linear regression models explain the spatial and monthly variations in the difference between the two temperature-averaging methods. We find statistically significant correlations between both the land surface and atmosphere variables studied with the difference between temperature-averaging methods, especially for the extreme (i.e., summer, winter) seasons (adjusted R2 > 0.50). Models considering stations with certain LULC types, particularly forest and developed land, have adjusted R2 values > 0.70, indicating that both surface and atmosphere variables control the daily temperature curve and its asymmetry. 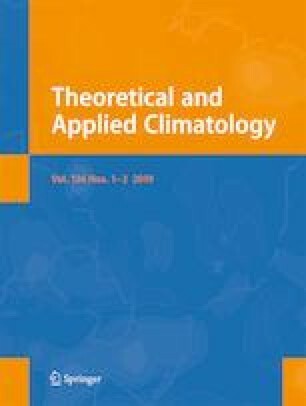 This study improves our understanding of the role of surface and near-surface conditions in modifying thermal climates of the CONUS for a wide range of environments, and their likely importance as anthropogenic forcings—notably LULC changes and greenhouse gas emissions—continues. This paper represents a portion of the first author’s PhD dissertation at Penn State University (PSU). We are grateful for the guidance and insight provided by dissertation committee members Drs. Brent Yarnal, Jon Nese, and Martin Tingley. Partial funding for this research was provided by the Pennsylvania Space Grant Consortium as part of its Graduate Research Fellowship Program at PSU.